Honda CR-V a wonderful SUV! The car is 2003 with 132k miles and runs great. I have no problems with my car. It drives smooth. Starts up every single time. It is also all wheel drive so it is great during the winter when it is bad outside with snow and ice. It also drives well in the rain. It has no rust on it which is great for being a 2003. I have had no issues with it whatsoever. I have done the normal oil changes and up keep which helps all cars but having no problems is great. The inside of the car is very big has lots of space. It has a big trunk with lots of storage space you can also put the seats down in the back to get even more space. I have a family of 5 we all fit with plenty of room. The back has 3 seats the front is two seats. It had a space in middle with a little desk in between seats that can raise up or down. It has 2 storage spaces under radio for whatever you need which is great. It also has a storage area under the passenger seat. The car can hook up to belts on car seat so you your child is double protected hook those up and also the seatbelt which is what we do with the car seats. It has great ac and heat. If looking for an SUV I would highly recommend this SUV at least look at it and take it for a test drive you will not be disappointed. Honda CR-V '03 is a fantastic all year round family vehicle. Honda CRV is a reliable model. The spare tire on the back of the vehicle makes changing a tire easy. The 4 wheel drive works great. The check engine light is always on because we haven't taken it in for maintenance. We do our own maintenance so the light just stays on. Our Honda is easy to work on and easy to use. I love the 6 disc CD changer and the radio is good as well. There is a back tire that tends to make a noise like metal rubbing from time to time. We just changed the brakes and the noise is almost nonexistent. I can fit 3 car seats in the back seat. The back seats fold down to make a large cargo area in the back. I love that the back hatch opens to the side and the window can be opened by itself. I have recommended this vehicle to my friends and neighbors. My Honda CR-V- the reasons why I keep on driving it!! 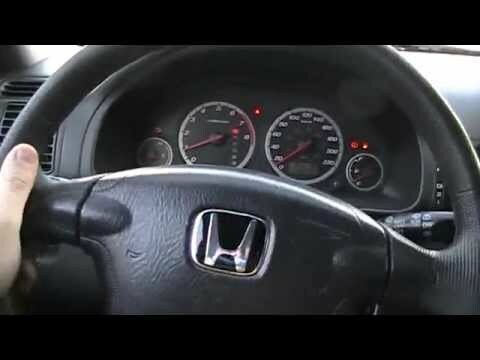 I love my little Honda CR-V and even though I bought it used, it has never given me any mechanical troubles. Other than regular maintenance, like a brake job and a new windshield, I have never had any problems with it. I have driven it back and forth to Mobile, Alabama to Dallas Ft. Worth, Texas area four times. I love it for road trips due to the seats folding down and you can pack a lot of stuff. It is a four door v six motor and has great gas mileage as well. All in all considered, I would highly recommend this vehicle to anyone who is considering a new car. I am planning on replacing this one with a brand new one very soon! On certain sport utility vehicles, the wiring harness of the driver's front air bag was incorrectly wired. In the event of a crash, the air bag inflation rate will be incorrect, which could increase the risk of injury. Dealers will repair the wiring. The manufacturer has reported that owner notification is expected to begin during July 2004. Owners may contact Honda at 1-800-999-1009. On certain sport utility vehicles equipped with automatic transmissions, excessive corrosion of the shift cable linkage could prevent the driver from shifting the automatic transmission into Park. If the vehicle operator fails to engage the parking brake, the vehicle could roll and a crash could occur. Dealers will inspect the shift cable linkage for corrosion. If corrosion causes binding, they will replace the shift cable. Dealers will also install a new corrosion-resistant control pin. The manufacturer has reported that owner notification is expected to begin during August 2003. Owners may contact Honda at 1-800-999-1009.